RK Films – The world is too small? or Is it? Welcome to September, 2018 edition of Carnival of Blogs on Golden Era of Hindi Film Music. Our focused topic for the month of September, 2018 is R K Studios, one of the last icons of the Golden Era of Film-making. RK Studios: The final curtain – Madhu Jain – With the Kapoors deciding to sell the iconic studio that was destroyed last year in a fire, a slice of film history has been lost forever – RK Films was in effect a Nargis-Raj Kapoor banner for a few years. Nargis played a much greater role in RK films than is widely known and acknowledged: supervising the lighting on occasion, going into the production details, recognizing the potential of the actress Nadira, giving generously when the money was needed, and much more. She was alongside him through much of their golden years together. They were in sixteen films together, beginning with Aag in 1948 and ending with Jaagte Raho in 1956. Tere mandir ka hoon deepak jal raha, by Vijay Kumar – Pankaj Mullick’s voice had a clarity and a boom that, I am certain, would have reached the man in the last row of a listening audience, without the aid of a mike…He had the voice of a supreme bhakt! Happy Birthday Lata Didi presents Lata Mangeshkar’s duets or trios with other Mangeshkar sisters. The title of the post – Lata Mangeshkar and S D Burman gave Bollywood many Immortal Songs – is a complete statement in itself. Happy 92nd Birthday, Noor Jehan! has a recently updated playlist of Noor Jehan songs. O Nigahen Mastana – the most romantic songs ever created by any music director, in which female singer simply hums her part. The One and Lonely Kidar Sharma: An Anecdotal Autobiography and Anirudha Bhattacharjee and Balaji Vittal’s ‘S D Burman: The Prince Musician’ are the book reviews. 70 Years ago Dev Anand got his first Hit FilmLata Mangeshkar and S D Burman gave Bollywood many Immortal Songs as Ziddi, in 1948. Hats off to Dev Anand – Dev Anand was known for very different hats /caps/headgears in different films, He was also very fond of these in his personal life as well. Dev Anand’s dreams that couldn’t be Fulfilled gives us a view of Dev Anand’s unfulfilled projects. Guide: A Spiritual Odyssey – Dev Anand’s creative effort reached its apogee in Navketan’s Guide, a film that accommodates more than one perspective. On the occasion of Dev Anand’s birth anniversary (he would have been 95 today), Vijay Kumar relives the finer points of one of the finest Hindi films ever made, exploring its streams and currents of thoughts and views. G P Sippy- A carpet merchant to the maker of Sholay – G P Sippy had turned a construction magnate and then plunged into filmmaking in 1951 with the Dev Anand film Sazaa and rolling of as many 17 films in his career. 60 Years of Madhumati which was released on 12 September, 1958, swept off a big gate collection and a host of awards. Asha sings for Madan Mohan – I and Asha sings for Madan Mohan – II, are the solos songs and duets/trios etc. respectively. Roshan aur Madan Mohan ki Asha draws some parallels and some not so parallels in the patterns willingness of the use of Asha Bhosle by these music directors. King of Ghazal Talat Mahmood with Ghazal Maestros Madan Mohan and Roshan and Best of Mukesh by Roshan and Madan Mohan are the two articles in Soy’s series on Roshan and Madan Mohan that provide finer insight to the use of these two singers by these two music directors. That Salil Chowdhry – A Creative Genius is evident from the fact that he was Composer, Music Arranger, Poet, Story writer and much more . The Masters: Rajinder Krishan is a collection of his songs composed by Madan Mohan, and then a select compilation of his work with other directors. The Guitar That Sang is the recollections of an elder brother of a nine-year older brother, David Vernon (Verni) Liddle, who was a guitarist who played for some of the greatest hits of Hindi cinema. Sadhana – One photograph that changed her life! was published in the famous film paper “Screen” publicizing the Sindhi Film “Abaana”. Piya aiso jiya mein samaye, by Vijay Kumar – Meena Kumari never looked so beautiful, and so fully subsumed in her role, as in this song. An anticipation of a rendezvous in privacy is writ large on her persona. Shakeel too understood the नज़ाकत of the situation and penned words befitting his stature as the poet of romance. And Geeta sang it effortlessly as if giving voice to her own emotions. We have two more articles nearer to this subject: Jaiksihan ‘s forte was romantic and western tunes and Hasrat Jaipuri – A Love Letter written in Real Life becomes Immortal in Reel in the form of Ye Mera Prempatra Padhkar……The post lists other Hasrat Jaipuri romantic songs in tribute to him. Some of the Great Background Songs of Bollywood – Songs being heard from the background has been a very important genre for Hindi Films. The post has listed many known songs, in alphabetical order. Aaj Kal Tere Mere Pyar Ke Charche – Brahmachari – Talk Of The Town – Gossip, the communication spreading through the grape wineyard, is autothermic, and once initiated, by a topic like the one in the preceding article, then is almost unstoppable. In praise of visible film craft is about the simplistic idea that the elements of filmmaking mustn’t draw attention to themselves. Royal Singing – It is often observed in popular culture that royals do not sing anything; if they do, many people think they should not be doing so. That’s because the arts—especially the performing kind—are seen as trivial affairs. The post lists some songs that were lip-synched by Kings, Queens, Princes and Princesses on Hindi film screen. Actors who portrayed the royals are mentioned too. Shola Jo Bhadke – Albela – Sparks Of Love – The Cuban percussion at the beginning played by Chic Chocolate warns you of the fire that is about to spread. Geeta Bali herself looking like a luminous spark of that fire, with a Hawaiian lei around her neck, a floral top and a wraparound skirt. Hindi songs featuring Umbrella, have included the songs where the prop, umbrella is seen throughout the song or at least for a significant portion of the song. Also someone has to handle the umbrella, if it’s just kept there, even if open won’t count for the list. Badi Der Se Megha Barsa – Namkeen – Withering Woes – There are some who might flaunt that wait when it is over. The show off of that wait you have gone through to your partner might take the romance in your life several notches up. Of course the flaunt is merely a charade to spice up the romance. From here begins the roothna-manaanaa and all the banter. It will also be a treat if this charade of flaunt is in Asha Bhonsle’s voice. ‘Heroine teasing Hero’ songs – Hero ‘Chhed Chhading’ the heroine is a relatively common scenario in Hindi films, but the exact opposite is not that common. No seductive songs are included, as those songs are usually a part of a trap arranged for the hero. So even if it sounds like a teasing song, they don’t count. And, the target should be one single person and not men in general or a group of boys. Two princes or two paupers? Parvarish, and an identity non-crisis – In view of the SC of India verdict on the Section 377 verdict, the fluidity of identity (sexual and other kinds) assumes a deeper meaning. Here is a reminder of an egalitarian 1950s Hindi film that simply sidesteps the identity question and even lampoons those who get all hot and bothered about it. Of Trees And Hindi Film Songs – If ecologically, tress provide much needed oxygen, then they also provide a ready nourishment to human love, particularly between a male and a female. The Ring Given to Suraiya by Dev Anand is still lying in the Arabian Sea – The real story revealed by Dev Anand in his autobiography” Romancing with Life” It was Suraiya herself who threw the ring far into the sea of Bombay only after the last meeting with Dev Anand….It was on the advice of his elder brother Chetan Anand that the actor decided to end his relationship with the actress and concentrate on his film career. While Dev eventually overcame the trauma of a broken relationship and moved on, Suraiya decided not to get married. Ventriloquism in Hindi Films is a well-researched post, on an interesting subject. We continue Micro View of Best songs of 1947: And the winners are? with female solo songs, wherein after having covered solo songs of Suraiya and Geeta Roy, Shamshad Begum. Rajkumari, Amirbai Karnataki (Part I and Part II) Zohrabai Ambalewali (Part I and Part II), we have now covered Khursheed, Noor Jehan & Kanan Devi, Meena Kumar, Naseem Akhtar and Zeenat Begum, Lalita Deulkar, Sharda Gangul and Mohantara, Paro Devi, Menakabai & Saroj Welingkar, Hamida Bano, Beenapani Mukherjee, Sitara Devi & Lata Mangeshkar in ‘other’ female singers. We have also presented a post that has presented Female Solos that I liked in 1947. We have also moved to Duets of 1947 with those of Mukesh with other female playback singers. In our tradition of ending our post with article on Mohammad Rafi or a topical song of his, I have picked up one SoY post, one video clip and a few songs that basically have link with the topics discussed in the present post. The story behind the song”Chahoonga Main Tujhe Saanj Savere” that tells how the song got in from nowhere. One, Lata Mangeshkar did sing over 40 songs of which you can count about ten memorable and a couple of all-time great songs, yet she was not the sole pole star, as she became from 1949 onwards. Therefore, dividing the female playback singers as Lata Mangehkar and ‘others’ as (has been) done for 1949, 1950 and 1951 would not be a true reflection of reality. Secondly, the Vintage Era also means entering a period of more unknown than known, therefore, the year-wise review would now be more a discovery trip. Musical landmarks: Like a golden Jubilee (Mela) and a silver Jubileen (Anokhi Ada) under the belt Naushad hasestablished his morchical position. His nearest rival C ramchandra has Nadiya Ke Paar and Kidkiin the year under review. Ghulam Hiader has presened his swan song on now the Indian soil – Shaheed. Raj Kapoor directs his maiden film Aag with Ram Ganguly as music director. Lata Mangeshkar has hardly any presence in these films. 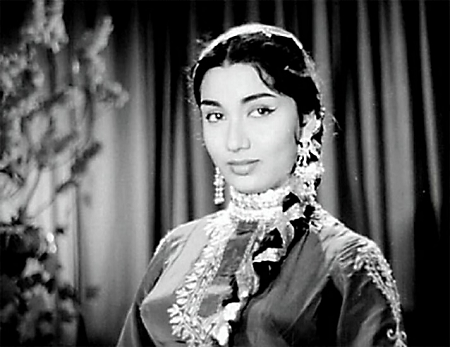 Fact file and Trivia notes that five songs of Meena Kapoor for Anokha Pyar were recorded on Lata Mangeshkar; Leela Chitnis played mother for first time in Shaheed; Mohammad Rafi holds a falg pole in Watan Ki Rah Mein Watan Naujawan Shaheed Ho; Ameerbai Karnataki composed music for Shahnaz, once only in her career; Vidya Nath Seth sang firve songs for Rooplelka of which he composed one song too. List Of Memorable Songs is a fairly representative list of films, music directors and known as well as less-known songs that were released in the year. I have re-compiled this list, under the title Memorable Songs of 1948, by adding the relevant link to YT file. For the year under review, Special songs also cover the songs which open a path of discovery on their own well as they have thir own personality. In this case too, I have brought these songs on the same page with List of Memorable Songs of 1948.
are concerned for the year 1948. All the posts that will appear on this subject here have been tagged as Songs of 1948 @ SoY.